When I was a kid growing up in Northeast Dallas my parents always took us camping on the winter breaks as well as during the summers. Not only did we do a bunch of parks and sites here in Texas we spent weeks at a time up in Colorado, Wyoming, and Montana. My dad was an avid hiker and he and I frequented many a trail. Little did I know then that, as fate would have it, once I moved out at age twenty I would never make it back to the mountains I had loved since a child. 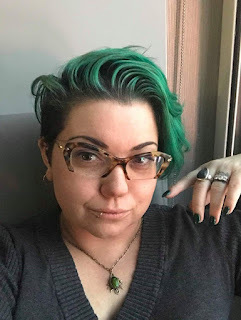 Author C. J. Box is one of a handful of writers who really bring the beauty of the wilderness alive for this reader. 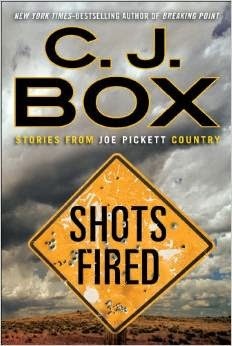 His latest book titled Shots Fired: Stories From Joe Pickett Country does it again in spectacular fashion. The short stories in this anthology are ones that have appeared in various anthologies as well as three brand new ones exclusive to this book. Four of the tales feature Game Warden Joe Pickett and /or Nate Romanowski. One story is set overseas in Paris by way of South Dakota and is a very dark tale. There is one based on a snippet of history from before WW2 and the magnificent Hindenburg. The ten tales presented are all good ones and readers get to them after a short introduction that explains the background of each work. The book opens with a Joe Pickett story titled “One-Car Bridge.” Joe has to deliver some bad news to the manager of the Crazy Z Bar Ranch one Saturday in September. The absentee ranch owner, a very wealthy man by the name of Lamar Dietrich, is known for his harsh ways and absolute refusal to accept anything less than total success by all of his employees. He won't be happy that the Game and Fish Commission has formally denied his plan to convert around two thousand of his sprawling ranch into an exotic game hunting operation. Mad does not begin to cover what Joe and others expect his reaction to be and the ranch manager and his family are in for it. In the “Pirates Of Yellowstone” Eddie and Vladdy have come a long way from their home in Prague to work in the park. They were assured by Yellowstone Park representatives in Prague that they had jobs to work for the official park concessionaire. Unfortunately, now that they are here and very ready to work, their jobs do not exist. The best the HR representative here can do is put them on a waiting list. They have to make some money---one way or another. From modern day readers journey back in time to September 1835 where the winter snows have come early and heavy to the mountains known as the Wind River Range in “The End Of Jim and Ezra.” Pushed hard by newcomers and a lack of beavers in their normal trapping grounds, Jim had made the decision to go far higher into the mountains than normal. Higher than any white trappers had ever gone before and it worked. It had worked so well Jim hadn’t wanted to leave. Now the snows have come and they can't get their beavers or themselves out. Hopefully the weather will break before they do. Nate Romanowski is the main focus of “The Master Falconer” though Joe Pickett does make a brief appearance. Visitors from overseas have landed in Saddlestring, Wyoming, and they plan on conducting some business with Nate. Not that he has any interest in ever dealing with them again even before they use what he cares most about against him. “Every Day Is A Good Day On The River” is the title of the next story as well as statement of life for many folks. In the tale, Randall “Call Me Duke” Connor has two clients in the flat-bottomed Mckenszie boat drifting down the river. Jack and Tim are supposed to be on the North Platte River for a day of relaxation and fishing. Jack is a bit nervous never having done this before, but Tim seems very quiet and in a mood. Jack would be quite a bit more nervous if he had any idea what is coming at them. Based on a picture from 1936 and some very interesting history “The Pronghorns Of The Third Reich” comes next. A debt from before WWII has come due and Clint means to collect it no matter what..
Joe Pickett is back in the nxt tale titled “Dull Knife.” Checking the license status of a group of ice fisherman on the surface of Dull Knife Reservoir in the Big Horn Mountains should be a fairly routine event. Even with all the noise the ice is making at twenty-two degrees below zero. Pickett's license check once he gets across the noisy ice leads to far more interesting things. “Le Sauvage Noble (The Noble Savage) comes next where those in Paris can't get enough of the idea of American Indian's and Cowboys. So on the advice of his buddy Lyle, Jimmy Two Bulls packs his recently purchased and allegedly authentic Indian garb and leaves South Dakota behind for Disneyland Paris and the Wild West Show. According to Lyle, if he plays the Indian role correctly good times will be had with the way too sophisticated women of Paris. “Blood Knot” comes next and this very short story is all about family legacy and appreciation. Intense and over quickly it can't really be described more without ruining the read. The final story is “Shorts Fired: A Requiem for Ander Esti.” Like the previous story, legacy and tradition are key components of this tale. It is late September and Joe Pickett is sent to investigate the shooting of a vehicle driven by Burton Hanks. He reported being shot at and claims to know the identify the shooter. Burton expects Pickett to dispense immediate justice by arresting Ander quickly and hauling him to jail, but Pickett sticks to his usual method of trying to figure out all the facts first. This collection of short stories is a good one and there is not a bad one in the bunch. 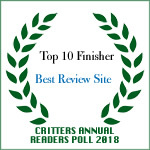 Split fairly evenly between the Pickett stories and others that feature interesting characters and often difficult situations, Shots Fired: Stories from Joe Pickett Country provides a lot of good reading. For those new to the Joe Pickett series of very good books, this read explains why so many are fans including this reviewer. This reviewer was selected to receive an ARC of the book by LibraryThing in exchange for my objective review. I'm reading this one now. Some good stories here. Had my definite favorites, but I thought they all were good ones. Via Alexandra Sokoloff: Book of Shadows, FREE!